Click here if you would like to purchase the paperback version instead! Play is fun, but don’t be fooled into thinking it’s just goofy or frivolous. Play is a powerful tool that can teach dogs to come when called, be polite to visitors, and drop the remote control instead of grabbing it and running under the bed! Tired dogs are happy dogs, and there’s nothing like learning the trick “Are You Ashamed of Yourself?” or the game “Find It!” to exercise your dog’s body and brain. You’ll have a happier and better-behaved dog once you know how to use play to train and entertain your dog. This eBook has something for everyone, whether your dog is an obsessive retriever or snubs his nose at the new toy you just bought him. Co-authors Patricia McConnell and Karen London, both PhDs & Certified Applied Animal Behaviorists, use this book for dogs with a variety of behavioral problems. From teaching impulse control with games or teaching a trick as an incompatible behavior, there’s nothing like the power of play to help solve a range of mild to serious behavioral issues. but make sense to anyone who "trained" their childhood dog. A great reminder and resource. Highly recommend it. and as a reward for good behavior." St. Hubert's Animal Welfare, Madison, NJ. 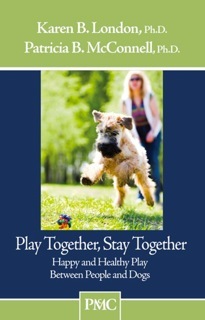 "This little book is a short, easy read that explains the importance of play for many reasons: bonding, enrichment, learning, exercise, etc. It includes instruction for how to engage your dog in play (including dogs that don't know how), what not to do, ideas for games, recommendations for "smart" toys, tricks you can teach them, etc. would be especially good for novice dog owners. “get the ball rolling” regarding to play. This book gives you a place to start."